I’m a big fan of Thinksound’s in-ear designs, but lately I’ve been listening more to on-ear and over-the-ear headphonesI find them more attractive, much more comfortable, and far easier to enjoy overall. So I was happy to learn that Thinksound is now working on its own on-ear design. 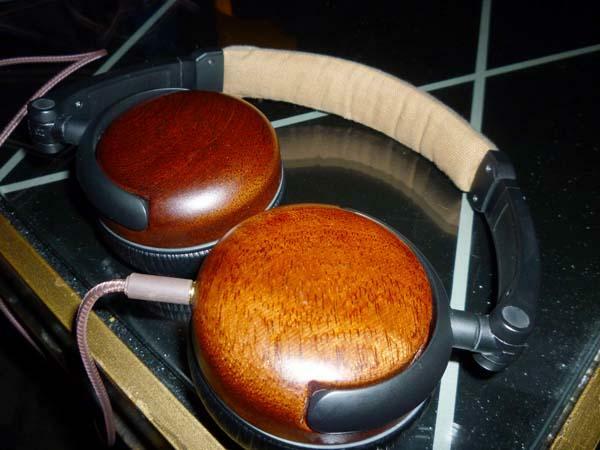 The yet-to-be-named headphone will cost somewhere between $200 and $300, and should be available sometime this spring. Here we see an early prototypeThinksound is still working to perfect the overall ergonomics. According to T+A (Theory plus Application) ElektroAkustik's Lothar Wiemann, the manufacturer is one of Germany's largest electronics companies. (It is distributed in the US and Canada by Dynaudio North America.) 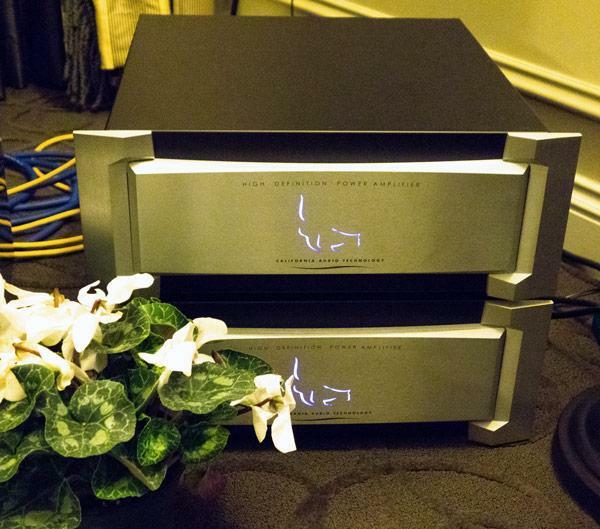 This company makes the 1000 W M10 monoblock hybrid amplifiers ($33,0000/pair), where the output stage uses tubes to handle the voltage and transistors handle the current. Octave's new MRE 220 tube monoblock amplifiers ($67,500/pair), which use KT 120 tubes, and Jubilee tube preamplifier ($36,000), both imported by Dynaudio USA, were used to power the new Dynaudio Evidence Platinum floorstanding loudspeakers ($85,000/pair). 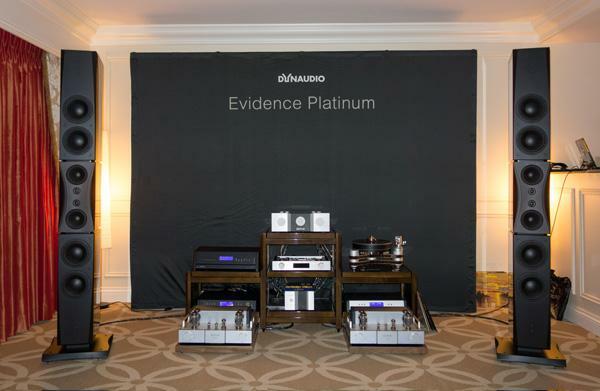 Source equipment included a Octave's new MRE 220 tube monoblock amplifiers ($23,700/pair), which use KT 120 tubes, and Jubilee tube preamplifier ($36,000), both imported by Dynaudio USA, were used to power the new Dynaudio Evidence Platinum floorstanding loudspeakers ($85,000/pair). Source equipment included a dCS Scarlatti digital front-end, Clearaudio Ovation turntable with Universal 9" tonearm ($32,000) and Clearaudio Da Vinci cartridge ($5000). Dynaudio's Mike Manousselis played me Sibelius's Finlandia, which showed off the Evidence Platinum's ability to create a large deep soundstage and amazing ability to reproduce a smooth string sound. 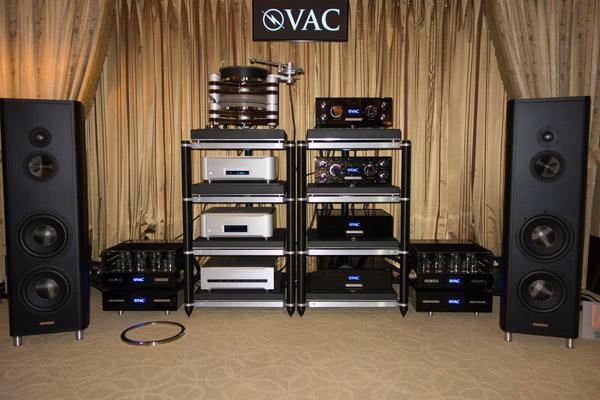 Valve Amplification Company's Brent F. Meyer (head of technical services) was bullish in his praise of the company's Statement 450 iQ monoblock amp[lifiers ($116,000/pair), shown here on the floor flanking each side of the Critical Mass equipment. The company claims that each tube in this amplifier's output stage is "held precisely at the optimal bias point, regardless of how loudly or softly the music is playing." The VAC iQ circuit also alerts the owner when the tube is growing weak or has failed, making "tube drama a thing of the past." 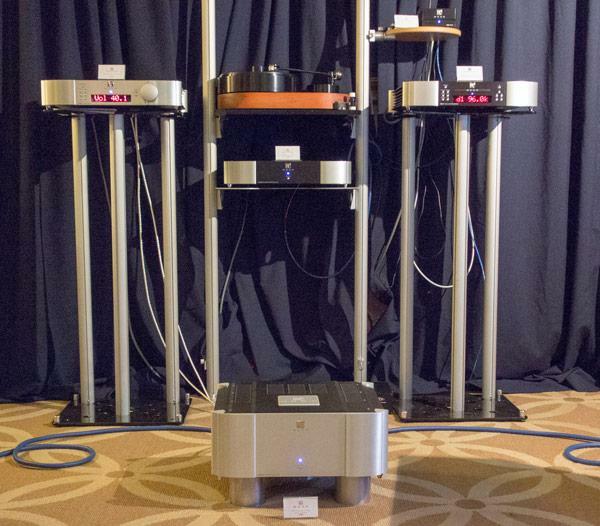 VAC also showed their Statement line preamplifier ($46,000) and Statement phono preamplifier ($50,000), in a system that included Magico S5 loudspeakers ($29,500/pair). Simaudio Moon's Lionel Goodfield, Vice President of Marketing, spent a relaxed half hour discussing amplifiers, cars, and various other topics of mutual interest. 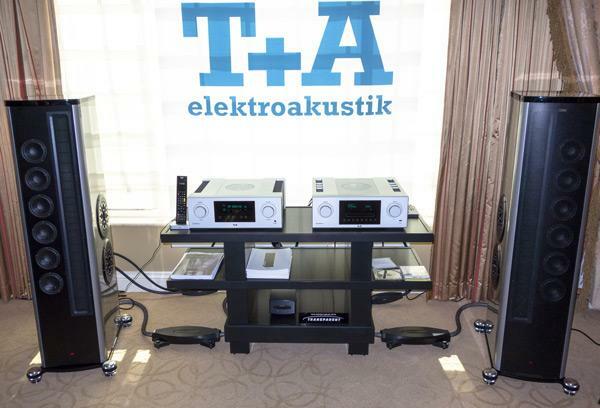 Along the way, he introduced the Moon Evolution 860A dual-mono amplifier ($14,000), shown sitting by itself in front of the other Simaudio products. The amplifier delivers 200Wpc into 8 ohms, 400Wpc into 4 ohms, 800Wpc into 2 ohms, the power doubling "all the way down to 1 ohm." It features special output devices made by Motorola for Simaudio. The sound from the Dynaudio C1 Signatures was clear, fast, smooth, and open. California Audio Technology showed their new 300.2 FD (Fully Differential) solid-state, 300Wpc, amplifier ($8800) that utilizes a bridged output stage. Like Theta Digital, the CAT 300.2 amplifier is another product designed and manufactured by Morris Kessler's ATI company in California. 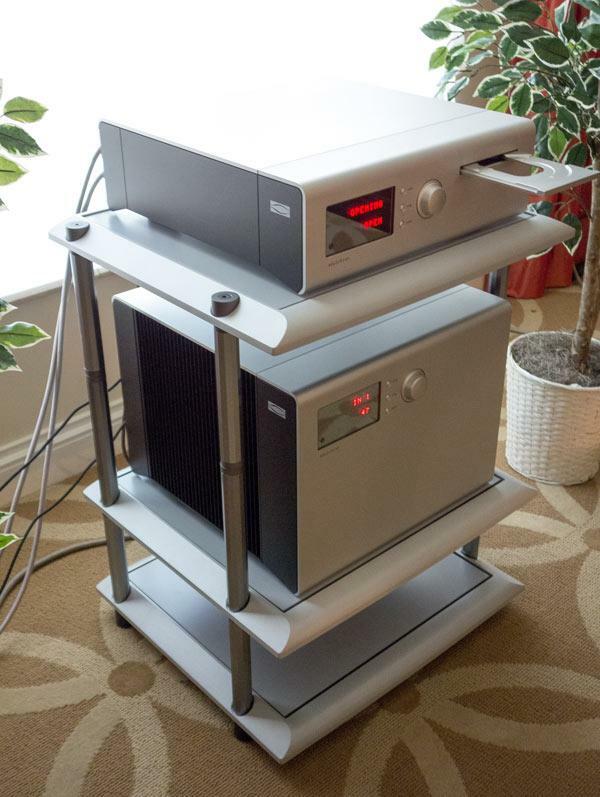 At the 2012 CES, Soulution Audio's Cyrill Hamer introduced me to the Swiss company's reference line of 700 monoblock amplifier ($130,000/pair) and the dual-mono, dual-differential 710 stereo (now $55,000) amplifier Michael Fremer reviewed and liked so much in August 2011. 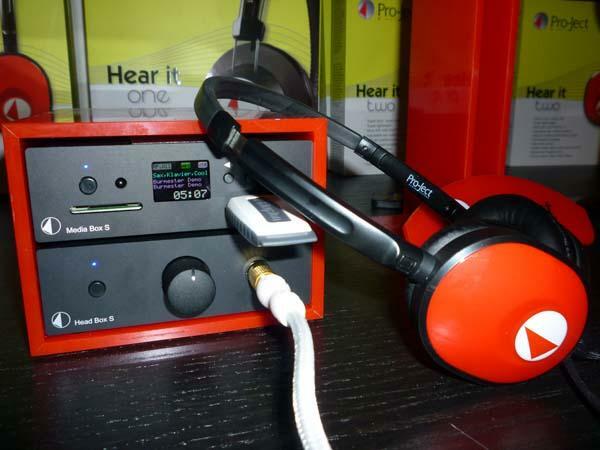 At this year's CES, Soulution presented its less-expensive 500 line. While keeping the same appearance as the Reference line, the 500 line features different internal designs, including the company's first integrated amplifier, the 530 integrated preamplifier/amplifier ($49,000). 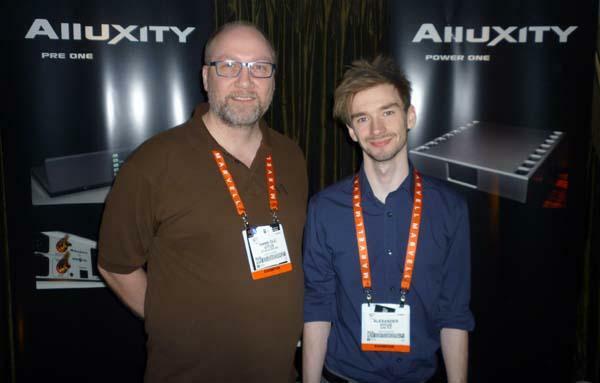 Earlier in our show report, Jason Victor Serinus visited with Hans-Ole Vitus of Vitus Audio, as well as Vitus’s son, Alexander, whose own company, AVM-TEC, introduced its Alluxity line of amplification components. Here’s a photo of father and son together. I love the fact that the enthusiasm and wonder for high-performance audio runs through the family. “We didn’t even have to force him into it!” Hans-Ole Vitus said of his son’s interest in audio. It doesn’t do DSD, it isn’t WiFi or Bluetooth-capable, and it certainly isn’t portable. It’s big, ugly, and, for most people, it’s almost entirely useless. 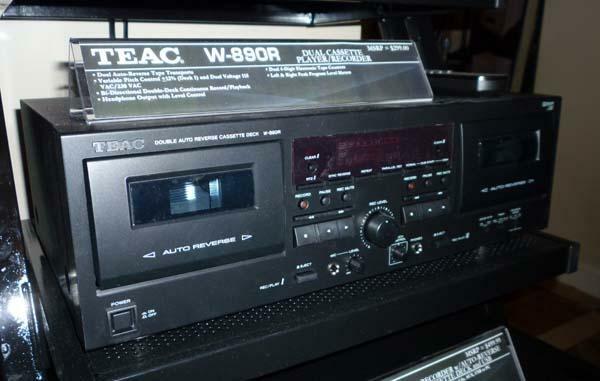 But the TEAC W-890R ($299) plays cassettes! Why cassettes?! Pro-Ject’s Media Box S ($359) is “basically a mini-computer,” Sumiko’s Norbert Schmied told me. It accepts a USB thumb drive (as shown), hard drive, or SD card containing MP3, WMA, AAC, or variable-bit-rate files up to 384kbps compression. It uses a 24-bit/96kHz upsampling D/A converter, and album metadata can be displayed and navigated via the front-panel display. Here we see it partnered with Pro-Ject’s Head Box S ($159) and the extremely lightweight and comfortable Hear It Two headphones ($79). Sarah Tremblay and Caroline St-Louis, representatives of the Montreal Salon Son & Image (SSI) show were at CES, promoting their upcoming show in March. Visitors to the Montreal show may be expecting to see Sarah and Caroline wearing blue wigs, but they've apparently abandoned that look. 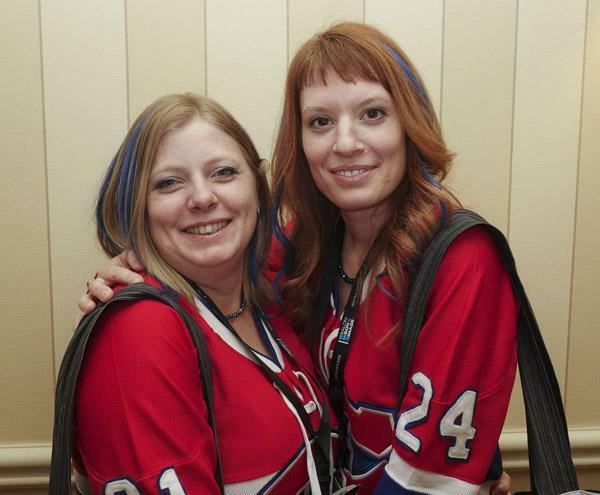 They're now dressed up as hockey playersthe Montreal Canadiens, of course. I'll be reporting on SSI 2013, along with, hopefully, Art Dudley. There's a chance that John Atkinson may attend as well. Boys and girls, if you all write to him about how much you would like him to attend SSI, perhaps he can be persuaded. 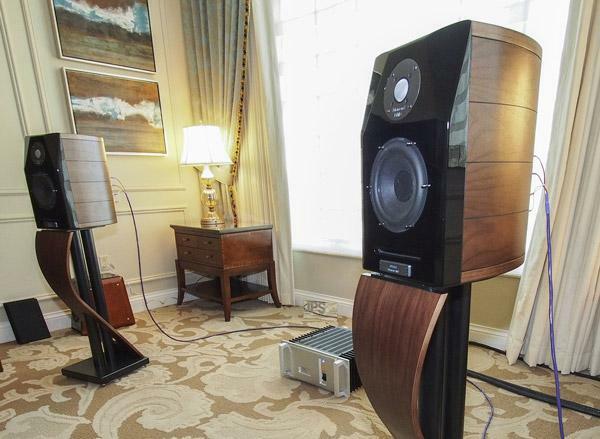 Wisdom's planar-magnetic drivers are used in some very expensive speakers, and they had a pair of their LS4 floor-to-ceiling wall-mounts at CES, which sounded superb, easily one of the best at the show. (It was in the "if you have to ask" price category.) Of more interest to me was the new Insight series of in-wall speakers, which use the same technology as Wisdom's more cost-no-object offerings. The drive units start at $1250 each (P2i) and go up to $5000 (L8i). That's more my speed! "What's different about this speaker?" was the question I posed the Usher rep when he told me that they had a new speaker, the Mini-X ($3500/pair), which supersedes the well-regarded Be-718. 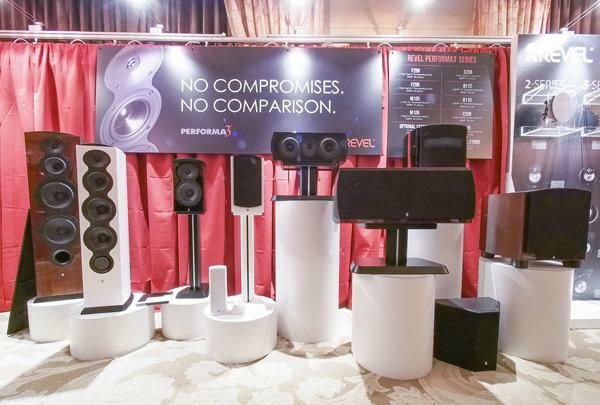 Larry Greenhill has reported on Revel's Ultima2 Salon, which, at $22,000/pair, is well beyond my CES coverage limit of $15,000,. But I can tell you about Revel's more affordably-priced offerings. 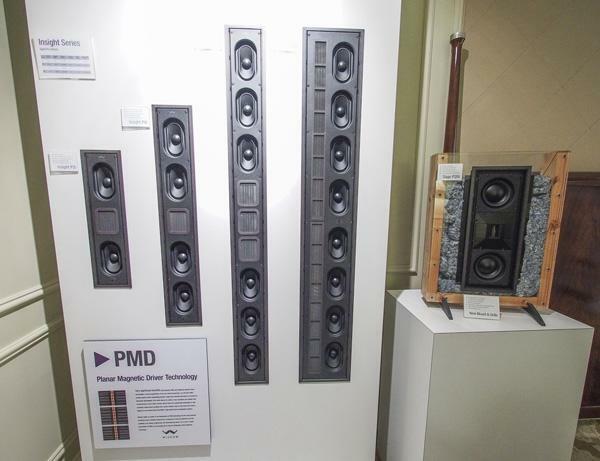 Speakers in the new Performa3 series started shipping in December, the price range starting at $1500/pair (M105 bookshelf-type) to the top-of-the-line $5000/pair F208 floorstanders. The speakers feature new transducer designs, next-generation tweeter waveguides, stylish enclosures, and low-distortion ports. The design process of Revel speakers utilizes position-independent double-blind listening tests. 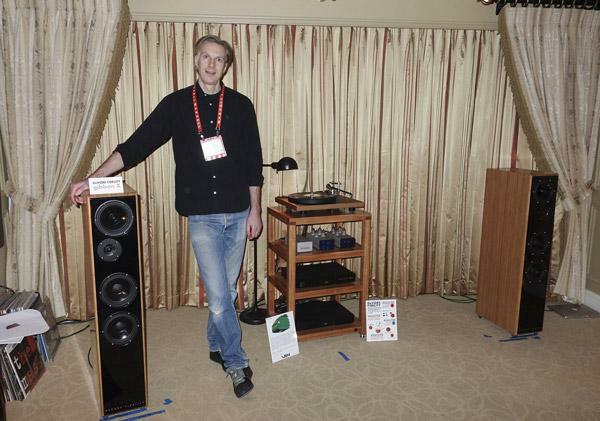 John DeVore introduced a new speaker at CES that is said to take "fidelity and flexibility to a new level." The Gibbon X ($11,000/pair), the first three-way speaker in the Gibbon series, has a new midrange driver that incorporates DeVore's Adaptive Surround, a new tweeter in its own isolated enclosure, dual 7" woofers that are claimed to move more air than some 10" drivers, and a hand-built cabinet made from solid bamboo.